(Cannon Beach, Oregon) – It’s where art meets whimsy meets functionality at Cannon Beach’s Stormy Weather Festival, November 3rd, 4th & 5th. Functional Fun is the concept of this festival at the DragonFire Gallery. 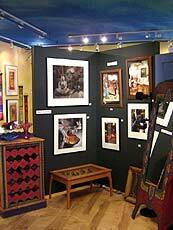 The show is called the Functional Art Show, featuring all of the gallery’s Northwest artists. 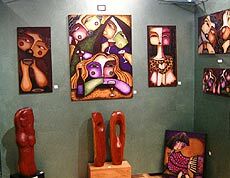 Just in time for the holidays, the Festival on will give all its patrons a unique opportunity to find original works of art that are not simply striking, but also come in handy around the home. Larger featured items include lampshades by Socorro Sanchez-Cantu. lamps by Will Richards, hand-painted boxes, tables and vases by Robyn Waters, boxes by Miska, glass sconces by Robin Evans, pendant lights by Christine Kittelson, fused glass end tables by Charlton Glass, and chairs by Sherry Casper and Michael Orwick. Sherry and Michael will also be participating in the Quick Draw at the SurfSand Ballroom on Friday night, creating a new functional art piece together in one hour. The piece will be auctioned off immediately following this one-hour event. Attendance is by reservation, and it is suggested to make your reservations now as space at this event fills up quickly. Other innovative offerings include hand-painted trays by Nancy Norman, blown glass umbrella handles by Eric Rader, framed mirrors by Melisa Kroening, candlesticks painted by Bill W. Dodge, hand-painted cushions by Paula Carlson, hand-crafted wooden valet boxes by Elizabeth Heatherington, beaded silverware & glass coasters by Jonalyn Horsfall, wooden canes, doorstops and letter openers by Chip Kohr and clocks by David Scherer. In the world of musical instruments, wooden flutes and mandolins are created by Brad Donaldson. Even the gallery owners have gotten in on the act. Scarves are made by Eeva Lantela and Mari Rockett, and handmade bags and unique clothing by Irja-Liisa Lantela will be shown. With so many inspired pieces to choose from, customers are sure to find something that will spark their imagination and please their eye. These artists are thinking outside the box and present work that stretches their creative imagination. Many of these artists will be in the gallery on Saturday, November 4th, available for a meet and greet session. During this time, patrons can enjoy glass lampworking demonstrations by Eric Rader and numerous musical performances from Portland folk duo Terra, and coastal locals Kathryn Claire, and Lee Clingman. These musical experiences will happen throughout the afternoon. The artists’ reception begins at 4 p.m. on Saturday, and Lee Clingman will return Sunday, November 5th at 11 a.m. to round out this exciting weekend. 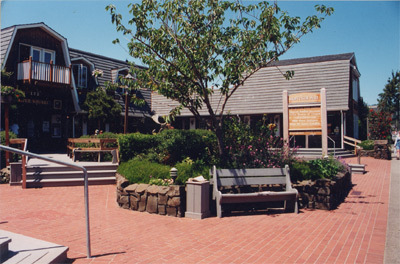 DragonFire Gallery is located at Ecola Square in Downtown Cannon Beach. For more information about Stormy Weather at DragonFire Gallery, see www.DragonFireStudio.com or call 503-436-1533. 123 S. Hemlock Street, Cannon Beach.